Muldoon, now conferring with Killgrave in an undisclosed location, speaks with the tech, with Lena. Lena clarifies the proposal she has...she wants a female body, and in exchange she will give Killgrave control of the tech. However, she doesn't want to harm anyone. Killgrave makes the choice for her, punching the other side of his body, Sledge. With his other hand, he grabs Rebecca by the throat and starts choking. He tells Lena that if she does not give him control of the tech and take Rebecca's body, he will kill both Sledge and Rebecca. At the Ace O Clubs, Jimmy sits alone. A larger man comes up and asks if he's seen Muldoon. Jimmy is telling him that he hasn't when Ryder shows up and starts belittling the larger gentleman, telling him that if he doesn't leave he will open up his private life in public. Ryder starts giving Olsen trouble, telling him that he wants to know what's been going on with the tech. Jimmy clams, and the lights go out. Ryder calls out to him, but Jimmy is off, looking for the cause of the blackout. Lena tells Killgrave there will be a charge, and Killgrave and Muldoon are both hit with a large electrical wave. Jimmy, meanwhile, notices all of the things that are going haywire with the tech. The doors open, the power is rerouted, the animals in the zoo escape and to Jimmy's horror, the rail whale slides off its tracks and hits a building. Jimmy goes to the rail whale and tries to save people, but Creeper leaps from the wreckage, asking Jimmy what he knows about what's going on. Killgrave gloats over Muldoon/Lena. Lena informs him that Muldoon's mind is safe in the tech, as is Sledge's, and if that she can be killed, but Killgrave will never have the tech. Story - 5: I officially take back what I said about issue 3 and 5, with regards to not knowing who Sledge and Killgrave are, and about the pattern that the maxi-series was falling into. Why? Well, I like admitting I am wrong about a comic's flaws. It's hard sometimes, being a reviewer, of not having the benefit of seeing the next few issues, and where things will lead. For instance, I trashed all over Emperor Joker when it first came out, not knowing that from it we would get Bizarro No. 1, Scorch, and any number of ongoing ramifications that justified the somewhat repetitive nature of some of the stories, which, in retrospect, were not the larger fault of all of the teams, just a few of the less creative ones. So... I complained that the stories were getting repetitious because we had five instances of things being brought to something through the tech and then Jimmy's reaction to it. Now I see that it makes sense in a larger context... it's 5 of 12 setup, which is a bit large, but now the action is certainly moving, and we have actually developed a care for these characters through tactful repetition. I mean, like I said, who was Sledge? Killgrave? Now we know. Now we care. Lena is a character now, and it's tearing whether or not the tech should go or not, and what it will do to Jimmy. In short, Jimmy is a character again, and defined. Maybe Superman is not, though I would argue he is at points of late, and maybe Lois lacks, Perry lacks, but Austen is a real source of hope for me now. I would not have been able to distinguish this from a GOOD run of Man of Steel, aside from the other prattle we've put up with lately. You could complain about where Superman was when the whale crashed, but he's a busy man, so I'll chalk it up to an invasion of some sort or another. I'm still ticked Bibbos has become a coffee bar, but what can you do, when everything else is working so well, eh? Where are Muldoon and Sledge, and why is it distinctively where Jimmy first met the tech? Why do the first five pages, while essentially the same situation, never change? It's a bit off...maybe it will come into its own, but this issue, it was not. Cover Art - 1: And cascading downward, we hit the cover. Jimmy...secret agent man with the star head. Creeper, skeebie punk hippie with green hair. Together, they are: THE BLEN-DORS! Why? Because they blend right into the annoying, detail free rest of the cover. Look! Creeper is losing a foot to THE NOTHING! Yeah! That's what I'll call the missing background from now on...THE NOTHING! And below? A HAND! Why? Just because. It's an implied Muldoon, but without detail, it could be Lois, right? Well, anyway, at least it happened in the issue, I'll give it that, they both came upon Lena in an undetailed alley, but...it's still a lousy, not very appealing cover. 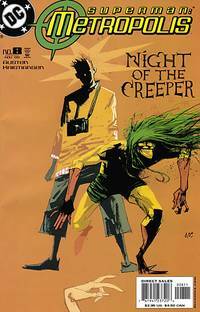 Night of the Creeper? Enough said.